The field of Robotics, Artificial Intelligence and Machine Learning is evolving rapidly that it is sure to change the lifestyle of mankind in near future. Robots are thought to understand and interact with the real world through sensors and machine learning processing. Image recognition is one of the popular way in which the robots are thought to understand objects by looking at the real world through a camera just like we do. 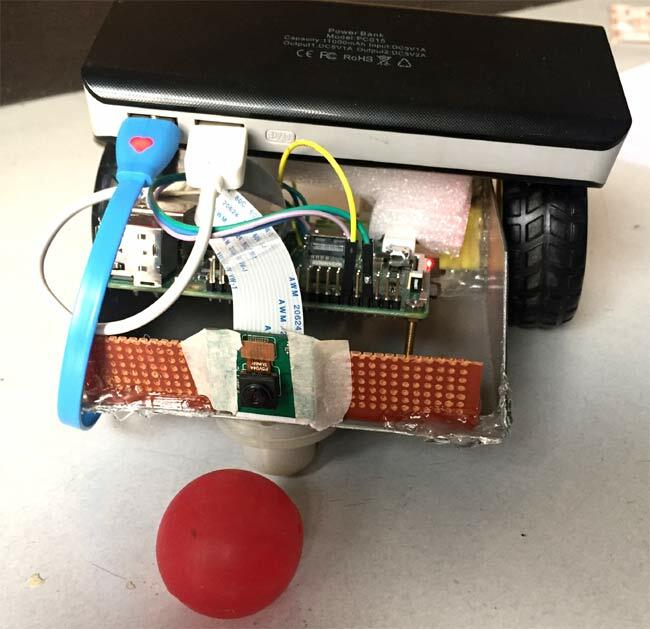 In this project, let use the power of Raspberry Pi to build a Robot that could track ball and follow it just like the robots that plays football. OpenCV is a very famous and open source tool that is used for Image processing, but in this tutorial to keep things simple we are using the Processing IDE. Since processing for ARM has also released the GPIO library for processing we will not have to shift between python and processing anymore to work with Raspberry Pi. Sounds cool right? So let us get started. Step 1:- Connect your Raspberry Pi to your monitor, keyboard and mouse and turn it on. Step 2:- Make sure you Pi is connected to an active internet connection because we are about to download few things. Step 3:- Click on Processing ARM, to download the processing IDE for Raspberry Pi. The download will be in the form of a ZIP file. Step 4:- Once downloaded, extract the files in your ZIP folder in you preferred directory. I just extracted it on my desktop. Step 5:- Now, open the extracted folder and click on the file named processing. It should open a window as shown below. Step 6:- This is the environment where we will be typing our codes. For people who are familiar with Arduino, don’t be shocked YES the IDE does look similar to Arduino and so does the program. Step 7:- We need two libraries for our ball following program to work, to install then just click on Sketch -> Import Library -> Add Library. The following dialog box will open. Step 8:- Use the top left text box to search for Raspberry Pi and hit enter, you search result should look something like this. Step 9:-Search for the libraries named “GL Video” and “Hardware I/O” and click on install to install them. Make sure you install both the libraries. Step 10:- Based on your internet the installation will take few minutes. Once done we are ready with for processing software. The circuit Diagram of this Raspberry Pi Ball Tracking Project is shown below. As you can see the circuit involves a PI camera, Motor Driver module and a pair of motors connected to the Raspberry pi. The complete circuit is powered by a Mobile Power bank (represented by AAA battery in the circuit above). To drive the Motors, we need four pins (A,B,A,B). This four pins are connected from GPIO14,4,17 and 18 respectively. The orange and white wire together forms the connection for one motor. So we have two such pairs for two motors. The motors are connected to the L293D Motor Driver module as shown in the picture and the driver module is powered by a power bank. Make sure that the ground of the power bank is connected to the ground of the Raspberry Pi, only then your connection will work. That is it we are done with our Hardware connection, let’s go back to our processing environment and start programming to teach our robot how to track a ball. The complete Processing program of this project is given at the end of this page, which you directly use. Further just below, I have explained the working of the code so that you can use it for other similar projects. The program concept is very simple. Although the intention of the project is to track a ball, we are actually not going to do it. We are just going to identify the ball using its colour. As we all know videos are nothing but continuous frames of pictures. So we take each picture and split it into pixels. Then we compare each pixel colour with the colour of the ball; if a match is found then we can say that we have found the ball. With this information we can also identify the position of the ball (pixel colour) on the screen. If the position is far left we move the robot to right, if the position is far right we move the robot to left so that the pixel position always stays at the centre of the screen. You can watch Computer Vision video of Daniel shiffman to get a clear picture. As always we begin by importing the two libraries that we download. This can be done by the following two lines. The Hardware I/O library is used to access the GPIO pins of the PI directly from the processing environment, the glvideo library is used to access the Raspberry Pi camera module. Inside the setup function we initialize the output pins to control the motor and also get the video from the pi camera and size it in a window of size 320 * 240. To detect the colour of the ball initially, we have to click on the colour. Once click the colour of the ball will be stored in variable called trackColour. Once we have the track colour and the current colour we have to compare them. This comparison is using the dist function. It checks how close the current colour is to the track colour. We also draw an ellipse around the found colour to indicate that the colour has been found. The value of the position is also printed on the console, this will help a lot while debugging. Similarly we can check the position of X and Y to control the motors in the required direction. As always you can refer the bottom of the page for the complete program. Once you are ready with the hardware and program it’s time to have some fun. Before we test our bot on ground, we should make sure everything is working fine. Connect your Pi to monitor and launch the processing code. You should see the video feed on a small window. Now, bring the ball inside the frame and click on the ball to teach the robot that it should track this particular colour. Now move the ball around the screen and you should notice the wheels rotating. If everything is working as expected, release the bot on the ground and started playing with it. Make sure the room is evenly illuminated for best results. The complete working of the project is shown in the video below. Hope you understood the project and enjoyed building something similar. If you have any problems feel free to post them on the comment section below or help. float d = dist(r1, g1, b1, r2, g2, b2); // We are using the dist( ) function to compare the current color with the color we are tracking. Then click on run program does not run : error is "No capture devices found"
"Visitor Monitoring System with Raspberry Pi and Pi Camera"
I did not face any issue using this. Try with a USB webcam and let me know if that is working. Why does not work with the OVA5647 camera? This is a nice article . You did a very good job of explaining every part of the program. Much easier to follow then the machine learning presentation I went to the other day..
Do you think you can do a presentation on how to get a robot to learn how to follow you on a paved pathway? Even navigate walkways from one point to another point? Yes I can. It should be easy. Will give it a try when I find time. An error appears saying " duplicate libraries are used for I/O one of libraries must be removed "
Try with a USB camera it might work. Iam getting error in code . Error : " Duplicate libraries are found "
iam getting error that sketch couldnt run. what is the problem ? I have completed all of the steps but when I run it, the program says "No capture devices found" I have also tried a USB camera which has the same results. you can refer the circuit diagram here. What doubt do you in it? If we use usb camera, then do we need to change anything in code? If that is the only camera attached to you computer. Then no, no changes are required. I am working on a project of tower crane which is not really similar to your project but, I have wrote a code for positioning the hoist (trolley) along the crane jib in Arduino. and I need to use a camera which should be located underneath the hoist to look at the load while travelling to determine where the load is while travelling. is possible to use a code that similar to your code which allows the camera to send a feedback to the Arduino which make the motors move to keep the load under the hoist during the travelling(without swing). furthermore, how to connect or interface my Arduino code for motor positioning with camera code? Thanks for your valuable effort for sharing such a great project with code. I followed your instruction and successfully completed the project. i)Only install the video capture library. Hardware IO is already their in processing lib. Then the code will work perfectly both for pi-Cam and webcam. Can you please tell me how to add bcm2835_v4l2 in /etc/modules? and please tell me from where we can get this? The first error is because you have installed two libraries in the same name. Go the library directory and delete the one you are not using. I solved the "duplicate library "error and i run the sketch. but i got only a black screen window instead of video feed. when i click on the black feed. the code works fine and motor driving commands working well. when i'm compiling the error was give to me as "camera not found" but i check my camera. it is working properly, Why is tht????? I wanted to personally thank you for putting the time and effort to write this tutorial, if I could get your contact information that would be great, my email is seifaeim@merrimack.edu if you could ever send me an email as soon as you get a chance to I would really appreciate it. Basically, I am building a ball fetching robot and am using a lot of your guidance from this tutorial. My proposed robot will potentially recognize tennis balls on the court, move towards them and collect them from the ground into a container. I wanted to see if you have the code for the part that connects the process of recognizing the ball using image processing to the part that makes the wheels move. In summary, I would really appreciate it if you could share your completed code (of recognizing the tennis balls and sending a signal to the motors to start moving the wheels towards the target) for this project with me? I would really appreciate it! Thank you so much again. Sir Why are you connecting mouse and keyboard with Pi?